A MIDI instrument can have up to 16,384 banks of 128 patches each. Patches can have names, like “Piano” for patch number 0, “Bass” for patch number 1, and so on. Normally, each bank contains a different set of patches, so each bank needs a separate patch name list. Most synthesizers start with a patch number of 0. You can assign a patch name list to each bank. You can also assign a default patch name list to the instrument, which is used for all banks for which you haven’t assigned a specific list. 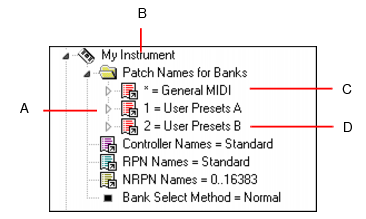 The previous section describes how to compute the bank numbers to which each patch name list is assigned. Each bank can also be assigned a special Drum flag, which indicates that all patches in that bank contain drum sounds. If you set this flag, the Piano Roll view will display drum notes as diamonds, and the Staff view will use percussion notation. Expand the Patch Names for Banks folder by clicking the + sign. The list expands to show the bank numbers and the patch name list that is assigned to each bank. Drag a patch name list from the Names tree to the Patch Names for Banks folder of the instrument you’re editing in the Instrument tree. Enter a bank number, or enter -1 to indicate that this list of patch names should be used as the default. Cakewalk displays the updated banks and patch name lists. If necessary, Cakewalk adds a new bank to the instrument definition. In the Instrument tree in the Patch Names for Banks folder of the instrument you’re editing, highlight the bank and patch names list. Press the DELETE key, or right-click on the bank name and choose Delete from the pop-up menu. Right-click on the bank in the Instrument tree, and choose Drums from the pop-up menu.